Don’t be fooled by the twee sugar cube dwellings that adorn Santorini. This is the most sought after of the Cyclades Islands. Behind the cobbled streets and blue domes lies a world of Greek chic. You'll find short-haul island-hopping honeymoon heaven, too, on lesser-known islands such as Folegandros, Naxos or Andros - and Mykonos of course. 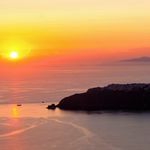 Santorini is the stuff of honeymoon heaven: staggering sea views, blood-red sunsets and ultra-chic hotels. Hotel Grace has the best spot, perched on the caldera with nothing but volcanic cliffs and wild flowers between you and the sparkling blue seas. We can’t imagine anyone not being blown away here. Alternatively, how about a hideaway house for two, with its own walled courtyard and secluded plunge pool for lazy afternoons in the sun. 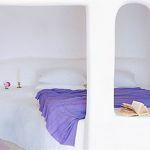 And we’ve several more favourites on Santorini to choose from, all visited by us and reviewed in honest detail so you can choose exactly what’s right for you. Combine Santorini with a few days on a smaller island such as Folegandros, where you can really escape the crowds on a fishing boat trip to a remote cove, before returning to poolside cocktails at Anemomilos. Or there’s this gorgeous little 15-room beachside hotel with stunning views and a laid-back vibe for sun and sea lovers. 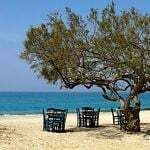 Head to Naxos for an unbeatable combination of sandy beaches (some of the best in Greece), mountainous interior and friendly tavernas on the sea’s edge. Kavos is the place to stay here – it’s blissful. For a picture-postcard Greek getaway – think turquoise waters, table-in-the-sand tavernas and white cube houses – this gorgeous six-suite hideaway set above the pretty harbour of Kini on western Syros ticks all the boxes. Perhaps our most hidden gem in the Cyclades is Onar, on the isle of Andros. Set on its own idyllic beach at the end of an unsigned track, its stone cottages have super-stylish bedrooms and oleander-shaded terraces for al fresco dinners to the hum of cicadas. Come here via Mykonos, where you can grab a few days of high life and fine dining before flying home. Wherever you go, we’ll give you honest advice and the very best rates – plus (at most hotels) an extra something to congratulate you on the happy occasion. Check out our honeymoons in the Cyclades and the latest special offers.